The Performance Package includes the following features: Dynamic Handling System w/ Dynamic Rear Steering, Torsen Limited Slip Differential, Adaptive Variable Suspension, Variable Gear Ratio Steering, Blind Spot Monitor, Rear Cross Traffic Alert, Lane Change Assist, Lexus Safety System + Pre Collision System, Dynamic Radar Cruise Control, Lane Departure Alert w/ Steering Assist and Automatic High Beam. Alcantara & Leather Sport Seats (8-Way Driver/8-Way Pass. ), Heated & Ventilated Front Seats, Driver Seat Memory w/ Memory Mirrors, Power Tilt & Telescopic Steering Wheel, Heated Steering Wheel (Adjustable Temperature Control), Paddle Shifters, LFA TFT Instrument Cluster, 10.3” LCD Display, Lexus Navigation, Enform Destination Assist (1 Year Subscription), Enform App Suite 2.0 (Slacker, Yelp, Sports, Stocks, Fuel Prices, and NPR1), Enform Safety Connect (Automatic Collision Notification, Stolen Vehicle Locator, Emergency Assistance Button (SOS), and Enhanced Roadside Assistance (4 Year Subscription), 13 Speaker Mark Levinson Premium Audio System, Head-Up Display, Backup Camera, Clearance & Backup Sensors, Auto Dimming Rear View Mirror, Integrated Garage Door Opener, Climate Concierge, Dual Automatic Climate Control, Carbon Fiber Scuff Plates, Carbon Fiber Roof, Alcantara Head Liner, Active Rear Spoiler, 21” Forged Alloy Wheels, Power Folding & Heated Mirrors, Auto-Dimming Side Mirror, Front Windshield Acoustic Glass, Rain Sensing Wipers, Triple LED Headlamps (Low & High Beam), Auto Leveling Headlamp System, LED Daytime Running Lights, LED Cornering Lamp, LED Rear Tail Lamps and LED Brake Lamps. This Luxury vehicle has a fuel economy of 8.9/7.0/8.0 L/100km 26.4/33.6/29.4 mpg (city/highway/combined). 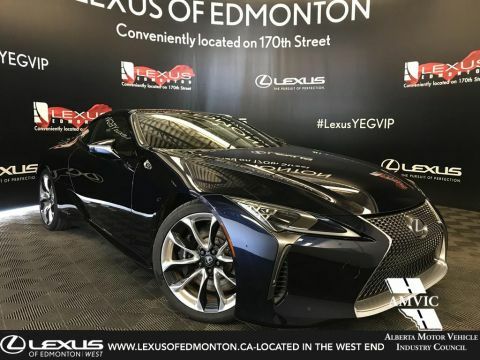 Lexus of Edmonton West Executive Demo.